Visit the tallest building in the Western Hemisphere and admire the incredible views over New York right near Ground Zero. 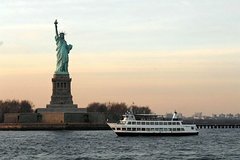 Sail around Statue of Liberty on a 60-minute sightseeing cruise that also journeys under the Brooklyn Bridge & over to Ellis Island. Climb aboard your boat at Pier 15 on the east side of New York City, and take a 60-minute boat ride to within 100 feet of the Statue of Liberty. Cruise right under the Brooklyn Bridge and see the most famous skyline in the world. Your live English guide will point out the sites as you journey along the river including the Empire State Building, the new Freedom Tower, the Manhattan Bridge, Governor's Island and more. Make use of both the indoor and outdoor seating, along with large open windows for your viewing pleasure. Get within touching distance of "Lady Liberty" and then move on to Ellis Island to take photos of the famous entry point to New York City. Marvel at the skyline of Manhattan and its famous skyscrapers, including the new One World Trade Center. Glide down both the east and west side of Lower Manhattan, and purchase drinks and food from the concession stand aboard the boat. A multilingual audio tour is available in English, Italian, German, Spanish, French, Korean, Portuguese, Chinese and Japanese, via a downloadable app. It is recommended that you download the app and the language content before arriving at the boat. Go to the App Store and search for 'Audiotour Guides NSDEV' (with the symbol of a pair of headsets). Open the app, choose your language and download the tour information in that language. WiFi is available on the dock and on the boat, however it is not always reliable, so it is recommended that you download the audio tour onto your phone before arriving at the dock. Skip the ticket line and enjoy the Sky Pod elevator 47 second ride to the top while watching a virtual time-lapse visual experience showing how the view of New York City has changed from the 1500’s to today. Once up at the Observatory, take in the NYC skyline and the New York water views of the East and West side of NYC.